Bamboo produces new canes (culms) in the Spring. These shoots emerge out of the ground and grow in height and diameter for around 60 days. During this 60 day period it will produce limbs and leaves. After the 60 day period of growth, this bamboo cane does not grow in height or diameter again. It will put on new foliage every year, and typically a cane last for 10 years. 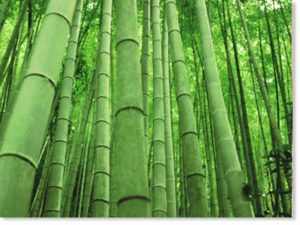 Bamboo is a member of the grass family. It is a colony plant, so it uses energy from this existing plant to produce more plants the next year increasing the size of the colony. The new plants will grow in the same manner. New shoots emerge to turn into a cane with limbs and leaves within a 60 day period. It takes bamboo about three years to get established. Once established the new shoots that emerge in the Spring (they will still only grow for 60 days) will continue to get bigger and more numerous from year to year. It takes a varying number of years (4-15) for different species to reach their maximum size. This is dependent on species selection, soil, sunlight, climate and watering conditions. Bamboo makes an excellent wall or privacy fence because it grows so close and so fast together. You can also make fences, gates, doors, Bars, Tables, musical instruments, the possibilities are almost endless.